Rodney Henry says Make it PieStyle, Jack! Find Pie store locations for Dangerously Delicious Pies, and check out the latest Menus. Show off your friends and family PieStyle by taking pictures with our unique PieStyle cartoon goggles which present a cartoon-like view of the world! Remember to vote for Rodney Henry! 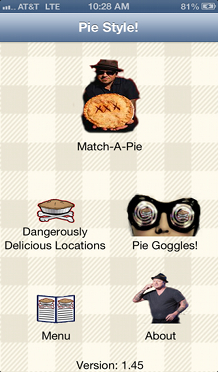 More Pie-tacular features coming soon.